Today it's Spice and Wolf's turn in the spotlight. It's a show about a traveling merchant, a fantasy world that looks like Feudal Europe, and a pagan wolf god. Hey, I didn't exactly say it was going to be entirely normal did I? Regardless of how that sounds, it turned out to be a fantastic show. Despite both seasons of Spice and Wolf being produced by different companies, they shared the same director and the transition was seamless. As a result, this covers both seasons. Spice and Wolf follows the exploits of economically savvy Kraft Lawrence* as a traveling merchant in a fantasy land much like feudal Europe. At the start of the series he pulls into a small wheat harvesting village for a bit of harmless trade. Things go along pretty smoothly and he eventually leaves the town after going to their annual wolf festival that pays homage to the wolf god Holo* that makes their harvests rich (or I should say that was how it started). Hey... wait a second. This voice actor for Lawrence is familiar... ah ha! It's you Lelouch! Playing two characters that have a knack for meticulous plans and Xanato's Speed Chess? How typecasty of you... WAIT A SECOND! You have a traveling companion whom is an immortal woman that has an unhealthy fascination with a specific human food? Coincidence? I DON'T THINK SO! In all seriousness, I just find this parallel to be hilarious, but it doesn't detract from the series in any capacity at all. 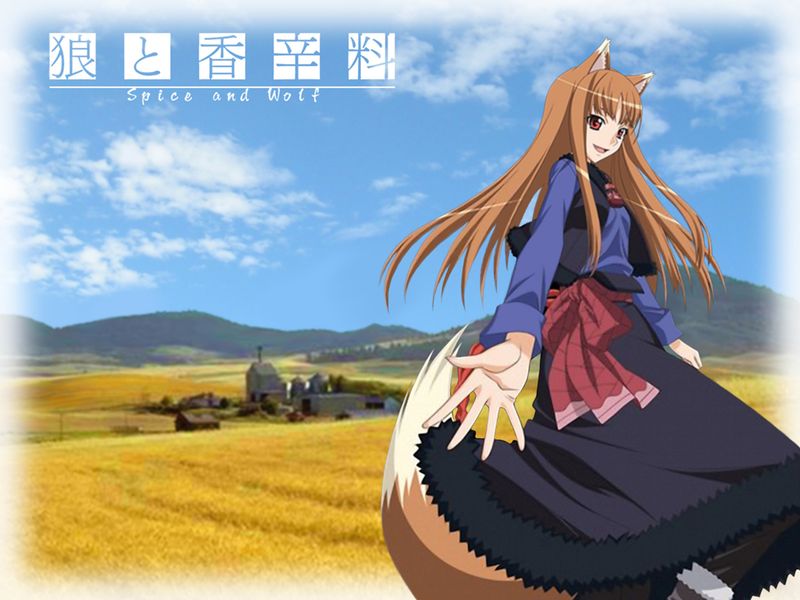 In fact, I think Spice and Wolf's duo are a far stronger pair. *These are my official spellings of the names. The entire community is literally at war to this day over how all the names are supposed to be spelled. Spice and Wolf is all about its economically savvy plots. It tells the audience a bunch of tales of a small merchant making it through the wild and lawless world of the middle ages. The show doesn't shy away from this for a second. It's plot and conflict are heavily driven by backroom deals, complex economic gambits, and betrayal. It is a fascinating watch if you have any experience with this sort of thing. It also makes the show rather... smart I guess. It opts to be complex and informative in addition to entertaining. On a more visual note: the animation in Spice and Wolf is lovely in every way. There are plenty of beautiful backdrops in the series to ogle at and the characters look vibrant and impressive. I was surprised by how solid the whole animation package is. I'm going to give a special shot out to Holo's animators for their work too. It's easy to miss but Holo's tail and ears are brilliantly animated whenever we see them. The production team expertly uses them to describe her mood and it adds whole layers to understanding her character. This sort of thing could have been easily overdone or underdone, but they manage to make use of it just enough. They also look natural, which was impressive to say the least. Lastly, I grew to love the slow, gloomy first opening and then the more upbeat second opening. They both just fit the themes of a merchant's lifestyle too brilliantly to not mention. For some reason I loved Lawrence's little monologues on the basics of economics sprinkled in at random in the show. There's a whole bunch of throwaway comments and filler content in the show that exist just to give Lawrence a chance to shine. The economic plots might be a bit contrived and overly backstab-ridden but these little gems will inform the viewer on some very important lessons in the world of economics. It's almost an educational series in some aspects. That aside, the one place that this show truly shined was the two main characters: Lawrence and Holo. Lawrence is an experienced 25-year-old traveling merchant that is working his way toward enough money to get his own shop. He's got the whole economics thing down pretty well and he has a knack for understanding the situation. He's a pretty good protagonist that always is a joy to watch at work. Holo is a pagan wolf god with a penchant for playfully teasing Lawrence every chance she gets. She's a really stubborn character, but also a very wise immortal wolf. She's got plenty of experience in the world which probably contributes to her sassy nature. She isn't just more clever than you, she knows she's more clever than you. She's an interesting female character amongst a sea of basic character archetypes. Together they form one of the best main character teams I've seen in a while. I'm almost disappointed in myself for not including Spice and Wolf in last year's line up so it could get the best main characters award. The way Lawrence and Holo interact makes up the biggest part of this show's watchability. Their playful banter and witty remarks during their conversions are excellent. It's savvy business sense up against centuries of experience and it makes for some incredible banter indeed. There's also plenty of exploration into what a pagan wolf god and a human's relationship would be like. Let's be honest though, the real reason we all watch these two so intently is because they're absolutely perfect for each other. D'awww, just say you like each other already. While they definitely dumb several economic concepts down and generally keep everything basic, Spice and Wolf will have the tendency to lose some viewers with its rapid-fire economic tension. It's very different from traditional drama since it requires the viewer to pay attention to the monologues and understand the basic tenets of economics. There's a whole lot of economic backstabbing and little things going on throughout the series. Viewers who don't want to keep up or aren't quite in the mood for something cerebral will be confused by some of the plots. It will seem odd to some that the cast constantly rotates. There is no fixed supporting cast for the show since they will all leave on a regular basis as arcs end; however, this is also justified since they are traveling across great distances between arcs. All I'm saying here is that it will be a bit disconcerting that we never get any deep exploration or development out of the majority of the supporting cast. Lastly, I feel a twinge disappointed that we didn't get a third season or some sort of finale movie. It ends on a well enough note but, after seeing two very strong seasons out of this show, I really wish we could have seen it all come to a close. Its been over four years since it ended though, so we probably won't see it. I'll probably pick up the novels in its place because I love this series. Spice and Wolf is a very high point in the marathon. It opts to be cerebral and smart with its drama by exploiting the basics of economics to drive its plot and conflicts. The show is very informative on the subject of economics and the writers did their homework because nothing is overtly wrong with the economic plots. It all makes quite a bit of sense. In addition to the brilliantly different approach to the plot, the two main characters are a joy to get to know. Lawrence and Holo are some of the best main characters I've seen in this marathon and beyond. They both excel at being both competent and complementary to each others' talents. Their relationship and what exactly it means evolves over the course of the series, leading to some very brilliant character moments. Their playful banter and witty retorts make every scene worth watching. This is best for someone who wants a smart fantasy series with a thing for strong main characters. The two main characters' relationship takes the center stage in the show and it'll keep you coming back for more. The economic plots are brilliant and the whole show's presentation is excellent. I'll probably go back to rewatch this series in the near future just to experience it all again. Spice and Wolf is a example of what I wish I hadn't missed in the years I left anime. It's a great series that I won't soon forget. My only regret is that it didn't get a third season. Spice and Wolf season one is available on Funimation and Hulu. Spice and Wolf season two is available on Netflix. Toradora! is a likely suspect for next time. This is part of Anime Marathon 2014, a continuation of Anime Marathon 2013 by popular demand. I'm on a mission to review every anime I can for the TAY community and anyone else that wants to read it. I can never guarantee when these reviews will be posted, but I'll do my best to keep it consistent.